The valiant crew: Loren, Drexie, Morrie, Ryan, and Tasha (left to right). The day was cloudy, but dry; the temperature cool enough to get us moving, but not warm enough to make us uncomfortable. The ground was wet from the March rains and we were all eager to get some work in. All in all, this made for a very productive work party. Loren tidies the mulch pile. 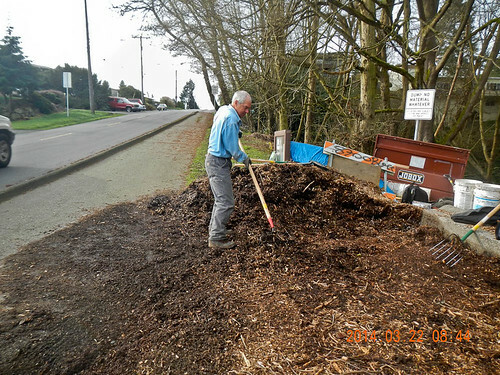 We started by tidying up the mulch pile. We’d ordered it last summer for a big project that cooler heads decided should be done by people experienced with steep slope work but have been nibbling at it ever since. 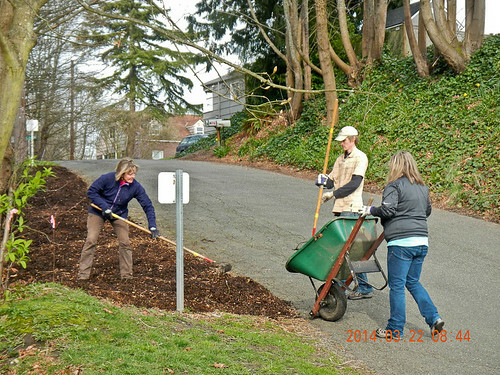 This has allowed us to do some low-priority but still important mulching — such as along the 90th St. edge. Drexie, Ryan, and Tasha spread the mulch. This doesn’t get much run off, but it’s a visible little slice of the park — not only the people who live up on 25th Ave. drive past it, but the moms’n'dads picking up their children from North Beach Elementary park along the other side of the street. The mulching didn’t take long at all, which allowed us to go to the newly cleared area at 850 feet. We started working in this area in February, and we’ll work our way upstream until we meet where EarthCorps left off last year. In the fall and winter, we’ll plant it up. We picked this area because it’s fairly dry and stable, and so overgrown with blackberry it’s a monoculture. Everything at Loren’s feet is blackberry cane; rising up behind him are the brambles. 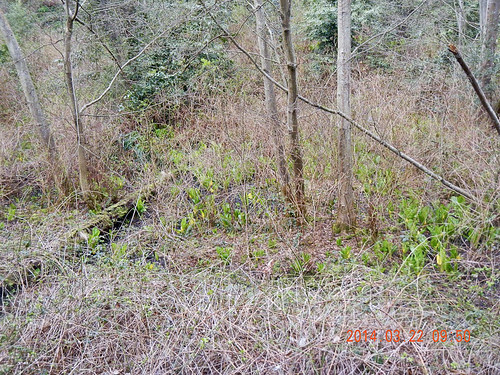 One nice side effect of the clearing was that it made more of the park that’s across the stream visible, such as this grove of skunk cabbage. Before we cleared the blackberry, it was completely obscured. The area we’re working in is also a big gap in the canopy, so it will be a good place to prioritize conifer reintroduction. In April, we’ll continue working here. 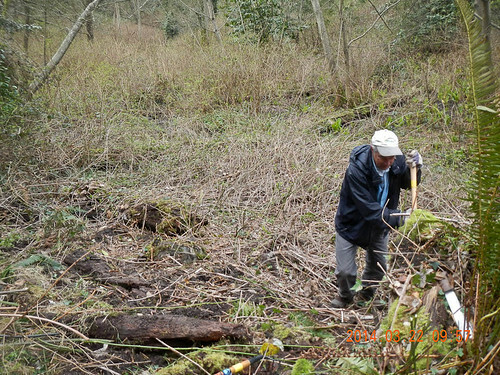 We have to balance where we work against a couple logistics: Don’t want to work too close to the stream bank until the summer, when it’s dryer; and don’t want to work in areas with a lot of piggyback or Pacific waterleaf until those have bloomed and died back. One lesson (among many) I’ve learned repeatedly is that a gradual approach is best, to take some time and learn the lay of the land and get to know the processes of the forest better. 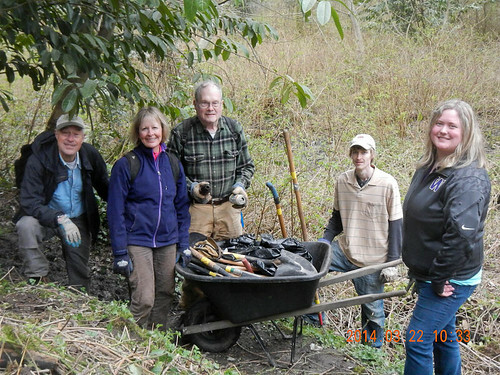 Our next work party is April 26th, 9 a.m. to noon. As ever, we’ll meet at the main entrance to the park, at 90th St. and 24th Ave. All ages and skill sets are welcome. If you can’t join us for a work party, you can support our work by making a donation to the Seattle Parks Foundation and earmarking it for North Beach Park. All proceeds donated will go to support the Friends of North Beach Park in our restoration efforts.